Burn MPEG to DVD/ISO/DVD Folder/Blu-ray DVD Easily. How do I burn DVD ready .mpg files as a video DVD? Standing for Moving Pictures Expert Group, MPEG is a group of working experts who sets the standards for video and audio compression and transmission. The MPEG formats are mainly used for media streaming and online videos. Thus among all the media files present on your PC, a large number would be in MPEG formats. If you want to play these MPEG videos using your home DVD player, you would need to burn MPEG to DVD. Moreover, when you burn MPEG4 to DVD, you move the not needed MPEG files to a disc for collection and create storage space on your PC. The MPEG standard contains different parts including MPEG-1, MPEG-2, MPEG-3, MPEG-4, MPEG-7, and MPEG-21, which specifies an aspect of the entire specification. MPEG-1 and MPEG-2 is a standard for lossy video and audio compression and .mpg/.mpeg is one of the file extensions of the same. To know more about MPEG to DVD burner and how to burn MPEG to DVD, go through the following part of the article. A good MPEG to DVD converter is the major requirement to burn your MPEG videos in high-quality DVD disc. Wondershare DVD Creator matches all your expectations from a professional burning tool. 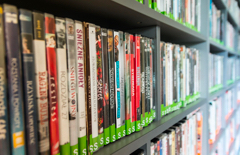 The software facilitates burning MPEG as well as other major videos, picture formats to DVD and Blu-ray discs. Wondershare MPEG4 to DVD converter is compatible with all latest OS versions of Windows and Mac. · Burn MPEG/MPEG4/MPG to high-quality DVD/ISO/DVD Folder/Blu-ray Disc. 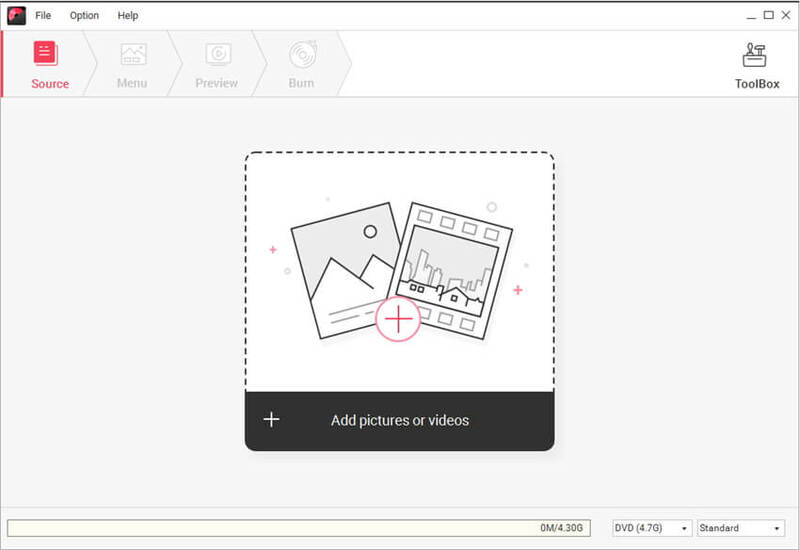 · Toolbox for photo slideshow, MPEG video editor, DVD to DVD conversion, DVD to Video conversion, Data Disc, ISO to DVD, etc. · Customize DVD menu with different parameters like title, music, picture etc. · Offer 100+ free static and dynamic menu templates to personalize your MPEG/MPEG4/MPG file to DVD. 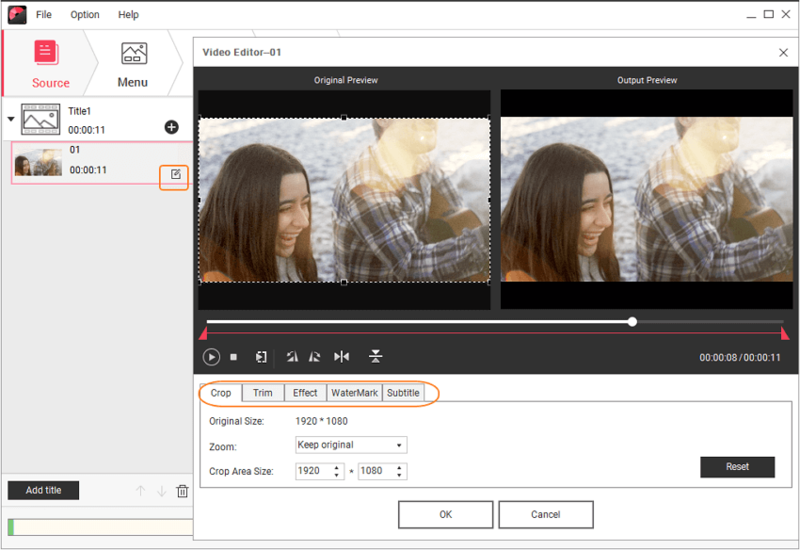 · Build-in editor to personalize MPEG videos by Trim, Crop, Add effects or subtitles, etc. · High-quality MPEG to DVD burning with real-time preview and fast speed. Step 1 Open Wondershare MPG to DVD converter and choose to create DVD. 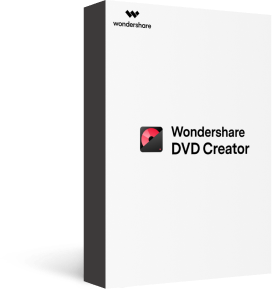 Launch Wondershare DVD Creator on your PC. From the available options on the software, select Create a DVD Video Disc. Step 2 Add MPEG videos to MPG to DVD burner and edit it. Click the + button to search and add the desired MPG videos present on your computer. 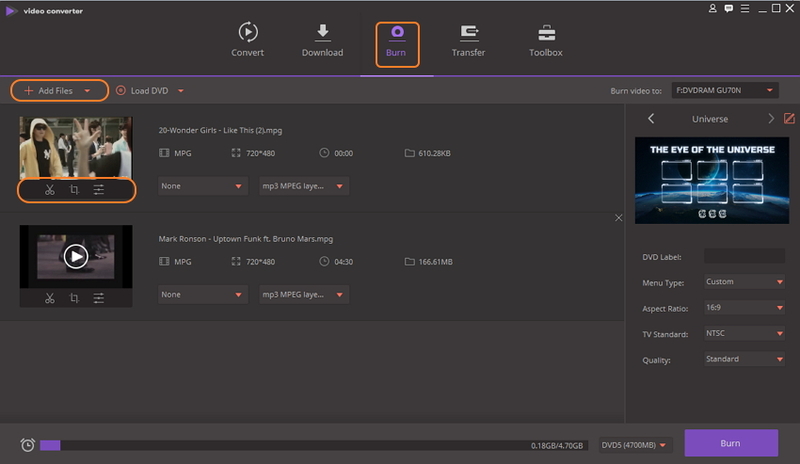 You can also directly drag and drop the MPEG files to the interface. If you want to personalize the videos before burning, click the pencil icon on the video thumbnail to open the Video Editor window. You can crop, trim, add watermark or subtitle using relevant editing function. Step 3 Choose DVD menu template and customize it. Click the Menu tab and different templates will appear on the right of the interface. 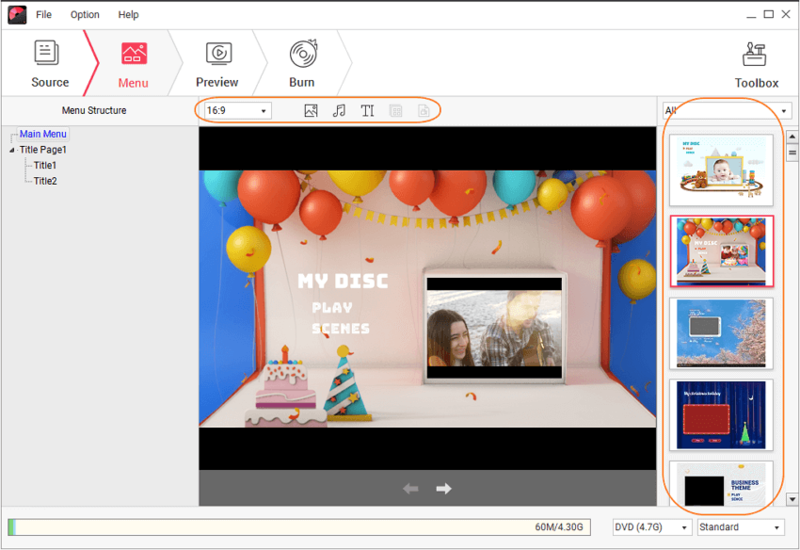 Choose your favorite template and double click to apply for your MPEG video to DVD. You can also create more chapters, add background music or picture, and even change the aspect ratio of the DVD disc to customize it. Step 4 Check created DVD and convert MPEG to DVD. Open the Preview tab to check the created disc. If something is not fine or missing, you can go back to Source or Menu tab to make needed changes. From the Burn tab, select Burn to disc option. If you do not want to burn videos to disc immediately, select Save as ISO option. Give an appropriate label to the disc and select other parameters. Finally, hit Burn to convert MPEG4 to DVD. So you can burn MPEG to DVD Mac and Windows in simple and easy steps using Wondershare DVD Creator. Are you looking for the software that not only converts MPG to DVD but offers a host of additional functions too? Go for Wondershare Video Converter Ultimate which is a complete video toolbox with an array of expert functions. You can convert all types of videos in different formats to DVD or Blu-ray disc, DVD folder or ISO files. The free DVD menu templates can be selected and customized to add stylish background image or music along with an option to change font size, color as well as other parameters. Burn all types of video files to DVD/Blu-ray, ISO files and DVD folder in excellent quality. Support over 1000 formats for video conversion at lossless quality. Convert videos to device-specific compatible formats. Allows video download from more than 10,000 sites including popular ones like YouTube, Vimeo, DailyMotion, and others. 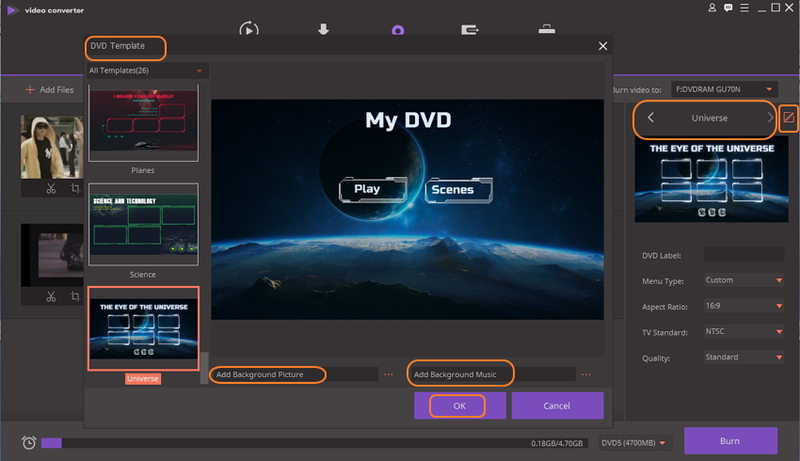 Built-in video editor with features like cropping, trimming, adding special effects, adding watermark, and others for professional looking videos. Video recording from streaming sites. Media files transfer to Android devices, Apple devices, external HD, and USB flash drives. Video casting to the TV as a media server. Available for all popular and latest OS versions of Windows and Mac. Step 1 Open Wondershare MPG to DVD video converter and import video files. Click Video Converter Ultimate on your computer to launch it. 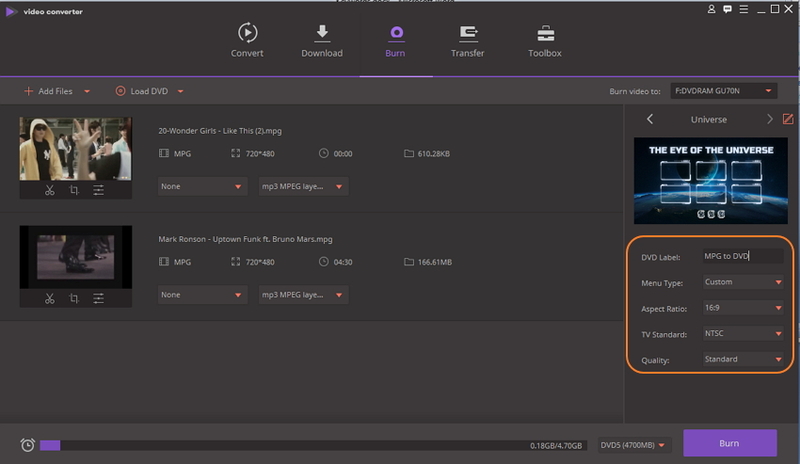 Select the Burn tab, and hit +Add Files to browse and load MPEG videos present on your PC. Alternatively, you can also drag and drop the videos. If editing of files is needed, click the desired edit icons present under the video thumbnail. Make needed changes from the pop-up window and click OK. Step 2 Choose and customize the DVD template. The right side of the interface shows the available DVD template designs. Choose what fits your DVD theme. To add background music or picture, click the edit icon to open DVD Template window. Step 3 Enter DVD Label and choose other parameters. Give a label to your DVD at DVD Label. 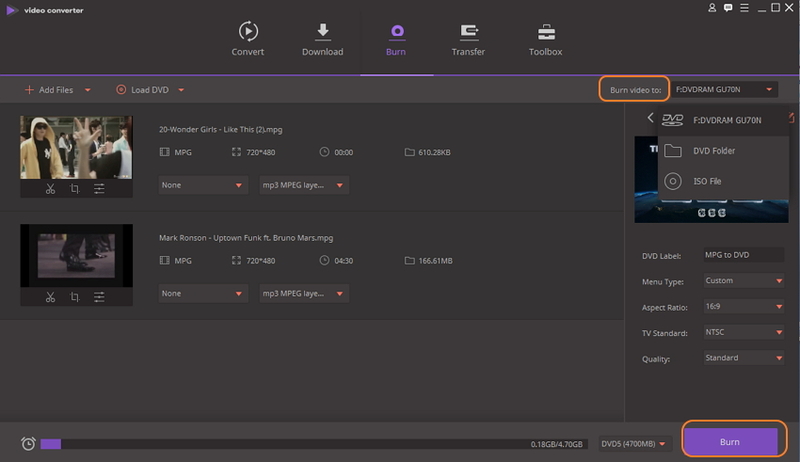 Also choose other disc parameters like Menu Type, Aspect Ratio, TV Standard, and Quality. Step 4 Convert MPEG to DVD format. At top-right corner, select location where you want to burn your MPG videos at the Burn video to: tab . Click the Burn button at the bottom-right to start converting MPEG to DVD. Wondershare DVD Creator and Wondershare Video Converter Ultimate, both are the good software to convert MPG to DVD format. Depending on whether you just need a professional DVD burner or software with additional features, you can make a choice between the two. Listed below is a comparison table of the software that will assist you to make a selection. So no more worries on how to burn MPEG4 to DVD, when Wondershare DVD Creator and Wondershare Video Converter Ultimate are there. Install the software and start burning your MPG files to DVD disc.